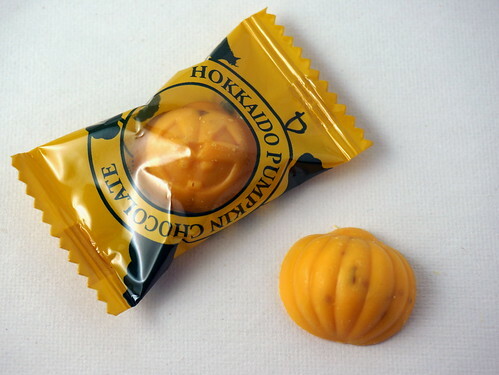 I inherited the remains of this box of Hokkaido Pumpkin Chocolate from Emma, who got them from a friend. 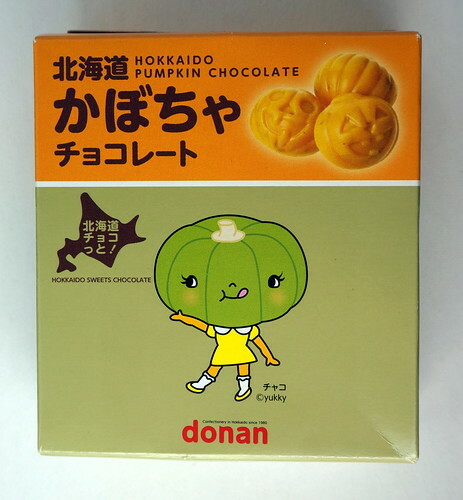 I was amused that pumpkin-headed mascot appears to be named Yukky. 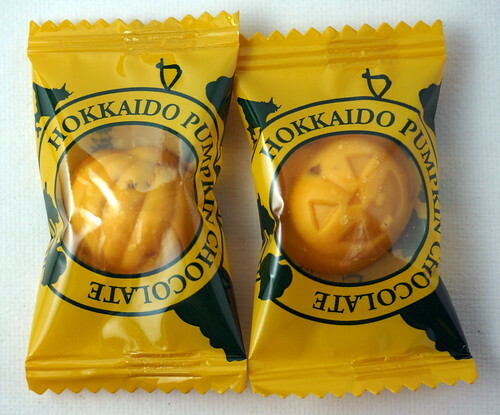 The pumpkin chocolates were all individually wrapped with a little window through which you could see the pumpkin shaped candies within. Some were jack-o-lantern shaped, while others were just pumpkins. The pumpkins were made of orange-hued white chocolate sprinkled with bits of crisp rice-like objects. Those bits gave the chocolate toasted puffed wheat notes that were immediately present from first bite. They eventually gave way to a grittiness when the chocolate was gone, from their husks perhaps. The white chocolate had faint notes of roasted autumn squash. It was just lightly sweet and mostly vegetal in flavor. I missed the spices that usually come with pumpkin desserts in the U.S. While I appreciated the beauty of the treat, the flavor wasn’t my thing. While I usually complain that U.S. sweets are too sweet, this Japanese one wasn’t sweet enough. An O.